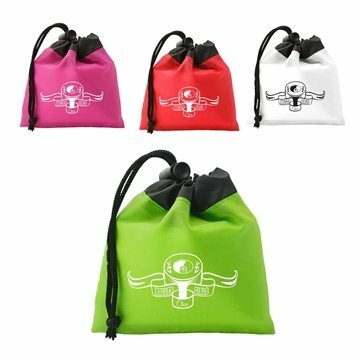 Brightly colored two-tone design 5" x 5" pouch with drawstring, compact and excellent for trade show giveaways, favors and gifts. Great incentive - youth and adults have fun with it. Again, a personal item for that grown ups. I've appreciated the friendly customer service throughout the ordering process. The only other comment I have is for customers to be sure that they are aware that they are ordering the exact product they need. the size of the ecofriendly bag was just right. Easy company to work with and the product we ordered was excellent. Printing can also be very perfect, everyone wants it. it was a very inexpensive product which was ideal for a free give a way. the quality of the product was great, I thought great for organization.